Witnessing An Epiphany: Marketing Caste. I witnessed today morning quite accidentally an epiphany, which someone must have experienced during the recent past. The local time in Vietnam was around 04:49 a.m. – 03:19 a.m. in India. I was walking on Pham Ngu Lao street in District 1, Ho Chi Minh city. This area is a touristic hotspot with many restaurants and plenty of places to stay to suit different pockets; and tourist buses start here to various popular destinations in Vietnam and Cambodia. Since going to Siem Reap (gateway to world heritage site -Angkor temples complex), takes long haul, buses to Cambodia start early. A bus was standing with its side cargo-hold cover pulled up and resting flush against the body, and displayed its capacious inside to welcome luggage of eager passengers. Tourism industry is pretty well organized in Vietnam, and buses here issue luggage tickets just like airlines do. Then I saw the inscription on the inner surface of the cargo-hold cover, which was at that moment visible in its fully glory. Blurry recognition of what the words meant drew my feet irresistibly towards it overcoming my reluctance and inertia of breaking the brisk pace I had set for myself by then. When the deeply insightful meaning of what was meant sank in my mind, which was not ready for such a profundity on such an odd choice of surface at such an odd time; it simply took my breath away. I say odd choice of surface because for most of the time the superb inscription would lie hidden inside the cargo hold and that too upside down (Is there a lesson too in store for us?). The inscription’s deep and layered meaning had the majesty of edicts of say an emperor like Asoka upon his acceptance of Buddha’s teaching. Before I reveal the inscription -I won’t stretch readers’ imagination inordinately, I want to point out that the Cambodian, who thought of it was quite assuredly conversant with an extant ancient feature of the Indian society along with rare understanding of 20thcentury strategies of marketing management conjured up in the United States. 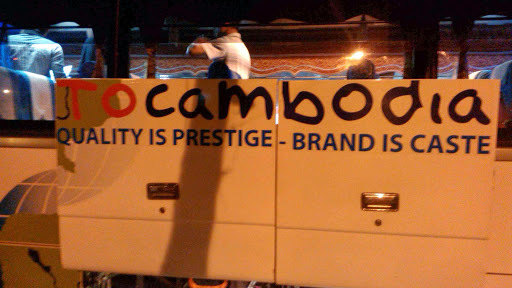 I am certain the *philosophic person* who came up with it is Cambodian because her insight appeared on a Cambodian owned bus. Unlikely that she would be a foreigner (of Indian, US, or UK origin) who has settled down in Cambodia, because her English appears somewhat limited to carry her insight better. Why? I would explain later. Please for now share my moment of breathlessness coupled with a sense of good fortune at witnessing a revelation. **To Cambodia**, at an obvious level is simply a welcome message to any visitor, who is keen on that destination. On a more subtle plane, it could mean that the aphorism, which follows, is a preserve or insight of the Cambodians alone. 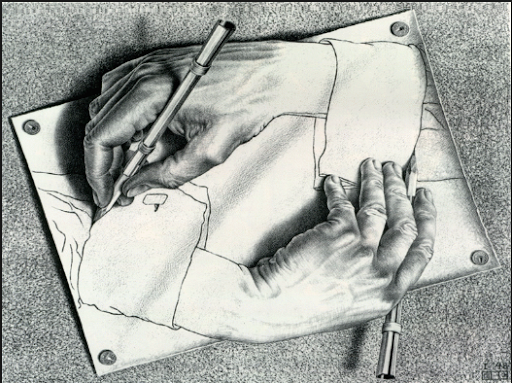 Those who are familiar with recursive paintings of Maurits Cornelis Escher, would see the tight one step coupling between *Quality-Brand* and *Prestige-Caste* that our unknown benefactor has so beautifully realized just like in the following sketch by the famous painter. Try to separate out the two elements, and the whole falls apart. If I were allowed a little liberty, the true import of this insight would be better carried by tweaking it ever so slightly. I think the word ‘Merit’ would carry the flavor of the original far more wholesomely than the word ‘Prestige’. What were the original Cambodian words, which revealed this epiphany in thought before being rendered in English for wider audience? That question would remain most likely unanswered to my eternal bewitchment. The conflation of Brand with Caste may probably need some explanation. The word *Brand* emerged from the practice of Hot *Branding* used for the marking of ownership of large livestock in the American Wild West. The rough and tough culture of the Wild West soon sprang new roots in the aggressive tumble of modern advertising and marketing. Brand emerged as a mark of identity to distinguish a product of (arguably superior) quality as its promoter contended from its competition. When a brand was created, what mattered was the product or service of *Quality* that the brand sought to distinguish from the rest. However, a clever and huge investment made in brand promotion, stability, and growth, soon gave the abstract, intangible *Brand* a solid, material reality of its own; and the original product or service it represented soon faded into a ghost like apparition. What the consumers today consume are *Brands*, and not the products or service. Brands have become tangible, products/services invisible and inconsequential. Experts of ancient history have it that Castes began as Class in India of antiquity, where an individual’s station in life was decided by his merit in life skills. In the absence of material explanations for the phenomena of life and nature, metaphysical explanations held sway, and one who bore that knowledge –priestly class (Brahmins)- received the highest prestige. Brahmins were closely followed by Kshatriyas-persons who bore arms with distinction and carried the burden of protecting the community. These two were followed at some distance by Vaishyas–the persons of trades and commerce, and still farther by Shoodras, who were artisans, farmers or menial labourers. This system of social division of labour and prestige had internal mobility based on individual merit. However, just like Brands, this system of merit based mobility –up or down- ossified with time, and soon accident of birth began to decide a man’s station in life rather than his merit. The Classes were Casted by Birth, and a Graded Hierarchy of Castes was established that has endured over millennia. 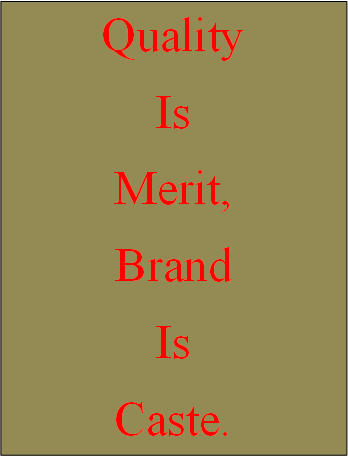 Coming back to the quote that engendered this post, it has conflated seamlessly the duality of Quality-Brandand Merit (Prestige)-Caste into a (Quality-Merit)-(Brand-Caste) continuum just like a Möbius strip. I owe this person a great debt and dedicate this post to her genius. However, I do this not without serious misgivings. After all, wasn’t she trying to build Brand-Caste of the Cambodian Tourist Company? An uneasy thought to live with, Isn’t it?